One important aspect of a KPI dashboard is the ability to share it with management, colleagues, stakeholders and clients. It needs to be easy to share, and it needs to look good. In Target Dashboard, we have made a few significant improvements to the ways in which you can share your charts and visuals. The most notable changes are to the Presentation feature, but we have also added customisation to the email digests. 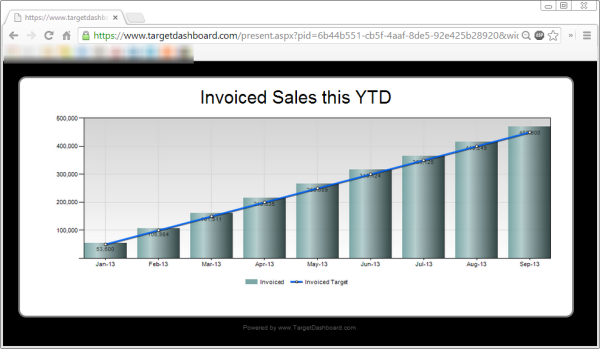 Target Dashboard presentations can be displayed by any device that has a web browser – a computer, and iPad, a smart phone, or even a TV screen or projector connected to a computer. It can be used in meetings, sent to people that can view it remotely via a secure sharing link, or deployed on screens across your offices. With the updated presentation feature (Available to Enterprise users only. It is also available to all trial users.) you get a whole new presentations homepage that can be accessed from the top menu bar. From here you can create new presentations using charts, scorecards and other visuals from any of your dashboards – all in the same presentation, should you want to. You also get an overview of all the presentations that you have permission to edit. This permission is set when the presentation is created, along with the settings for who can view the presentation. In the example presentation below, any user in your Target Dashboard account will be able to edit the presentation, and for someone to view it, you need to send them both the secret web address and the password, which can be changed at any time. Why not go and have a look at it yourself? Create your own presentation to see what you can do. Another feature that we have improved recently is the email digests. You can now rearrange the order in which your charts and visuals appear in these emails. You can find the option to do this in the dashboard settings menu for each dashboard. Using this new functionality you can reorder of the charts in your email digests by dragging and dropping, much like you would in the settings for the Management Report Pack. As always, if you have any questions, you can contact us on support@targetdashboard.com.